Brexit - can you fix stupid? It takes a lot to surprise the BBC’s John Humphreys but that’s what happened yesterday morning. Professor Anthony Seldon is an eminent historian and current Vice Chancellor of the University of Birmingham. Michael Cockerell is a respected documentary maker and he has made outstanding programmes about the likes of James Callaghan, Margaret Thatcher and Tony Blair. As the BBC’s Today programme sometimes does on a Saturday morning, it reviews the story that has dominated the week’s output. In this case, Brexit. Seldon said: "The current turmoil in British politics totally eclipses Suez, totally eclipses everything, we have never been here before. The lengths of fixation of government on this one issue, the complexity of the problem...20 resignations utterly eclipsing Suez, Falklands, Iraq War, the country more evenly divided, more deeply divided, families, communities, churches, than on any issue. Scotland and Northern Ireland’s future in the union both up for question at the same time, the Conservative party more deeply divided in its 200 year history..."
Cockerell then chipped in: "It is the most extraordinary time I have seen in British politics. One of the times which it does remind me of, in some ways. was when Jim Callaghan was prime minister and we had a huge economic crisis and we went to the IMF, we wanted a loan from the IMF to stop the country going bankrupt, we asked for a loan of three billion, that was in the old days when a billion was a lot of money and that was more than the IMF had loaned anyone but the Labour cabinet was absolutely split on this." Seldon came back in and said: "If we get it wrong, I feel as a historian the social fabric of the country will be stretched to breaking point." Humphreys jumped in and asked him: "What does that mean, rioting in the streets?" Seldon replied: "It could do, yes, I think this is a moment of significant peril. Imagine, for example if there is a second referendum and the country is very divided, it was pretty evenly divided at the referendum in 2016 and now the balance of voting is just the other way, think of how angry the Brexiteers will feel if there is a second referendum that goes against them, this is a moment of significant peril and that is exactly why we need to have grown up MPs thinking not of their egos, not of their ideologies but actually a novel idea of the nation at this moment of real, significant national peril, they should be thinking of the nation, not plunging the country into a no-deal Brexit." Cockerell came back in saying: "I do think what we will be hearing from the prime minister and other ministers who support her is the national interest; but of course behind the scenes they are plotting and scheming. It used to be said that loyalty was the Tories secret weapon. It seems now that disloyalty is the Tories default setting." Humphreys said: "Thank you very much indeed..."
Seldon said: "Not very optimistic, have a nice weekend." Humphreys had the final word: "Thanks for cheering us up." While the slice of Radio Four was enlightened and mesmerising, it didn’t even mention, never mind attempt to analyse the blindingly obvious. Possibly because most of the contributors are ignorant about it, the very same stark naked Emperor element was avoided during the three-hour pummelling of British Prime Minister Theresa May in Westminster during the week. It is the orange/green factor, the Irish Question, that dominated and often poisoned Northern Ireland politics for decades; the row that frequently spilled over the border and stunted North/South relations. Seventeen months ago the germ crossed the borderless Irish Sea, found its way to Westminster and contaminated the Conservative Party and British politics. And Theresa May, the heroic figure of last week’s absorbing political thunderstorm, is, unwittingly responsible for it. The problem was created by her decision to call a general election in June 2017. She was attempting to strengthen her forces in order to combat the hard Brexiteers. The catastrophic contest produced a situation where ten DUP members hold the balance of power in Westminster, keeping her minority government in office. Another significant consequence of the election was the removal of three SDLP MPs who would have acted as a counter-balance to the DUP and certainly would have contributed a different narrative during the past week in Westminster. Mrs May didn’t intend it but by calling an election she brought calamity upon herself. Last Wednesday night she cut a heroic figure outside Downing Street, speaking from her heart, without notes. There was an even more telling angle than the head-on camera shot. It was the side view, showing her slightly curved figure, utterly alone providing a statement that was being watched by probably hundreds of millions of people. Politics is indeed a spectator sport but the House of Commons became the Coliseum on Wednesday as several Conservative MPs seemed to revel in publicly seeking out the most vulnerable zones of their party leader. The contribution of Jacob Rees-Mogg was particularly revealing. As an educated, practising Catholic, he would be familiar with the scourging at the pillar and the crowning with thorns. In the dozens of contributions, it was striking how the unavoidable truth about the island of Ireland question did not feature. The Conservatives are obsessed about themselves. The Brexiteers want out of Europe at all costs. The Labour Party has amnesia about the Blair/Brown contribution to the peace process and its sole objective is to get into power. But if Westminster is showing little appreciation of the Ireland question, the opposite is the case with the other side in the Brexit negotiations, the European Union. The remarks made by the Belgian politician, Philippe Lamberts, a member of the European Parliament’s Brexit committee during the week, make the case. On BBC’s World Tonight radio programme on Thursday, Mr Lamberts said: "This deal is the best that is achievable within the constraints set by a number of factors, not least of all the Good Friday Agreement. "This (the GFA) is a treaty that the UK has voluntarily signed and it creates constraints that made a clear-cut Brexit impossible actually because it is predicated on the common membership of both Ireland and the United Kingdom to the same political body called the European Union." "The UK leaving without a deal would of course hurt the United Kingdom. The supply chains would be disrupted; free circulation would be disrupted, airline flights would be disrupted, goods flow would be disrupted. I think than no one really knows how deep the implications would go but there are the practical implications and they would cut both ways - they would hurt the United Kingdom but also the European Union, especially those countries bordering the United Kingdom, Ireland to start with, and then the countries that border on the North Sea including my own country, Belgium. This is not a very encouraging prospect." When Mrs May gathered her cabinet members at Downing Street on Wednesday, she followed the logic of Mr Lambert’s arguments. In 1995 Bill Clinton, and his wife Hilary, became the first serving US president to visit Northern Ireland to assist the peace process: in 1998 Tony Blair was guided by the hand of history to help negotiate the Good Friday Agreement. In 2011 Queen Elizabeth bowed in the Garden of Remembrance and alongside Mary McAleese, said "A Uachtarain agus a cairde" in Dublin Castle. In 2015 Michael D Higgins said in Windsor Castle, "ar scáth a chéile a mhairimid" (we live in the shadow of each other). Theresa May’s stance on Brexit during the week was an acknowledgement (belated) of that thread. It accepts Northern Ireland is unique, that the relationship between the neighbouring islands is special and that shared membership of the European Union has helped to remove centuries old poison and distrust and change the dynamic. On Thursday night last I sat with Sammy Wilson at his constituency office in Larne’s quiet Main Street. 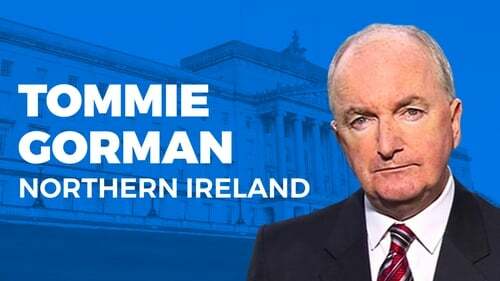 The previous night he said in one television interview that the European Union was intent on giving Northern Ireland a punishment beating over its decision to leave. Sammy has a reputation for delivering such soundbites. On a personal level I’m very fond of him. Like most of his DUP colleagues he always tries to oblige when, on RTE’s behalf, I come looking for an interviewee. In this case it was a stretch because the request was for a late night insert to Prime Time. Even though Mr Wilson had been on the go, full-on in Westminster and arrived back in Belfast a few hours before, he agreed to participate in the programme. To acknowledge his kindness, I travelled with a cameraman to be in Larne during the link up to Donnybrook. In the minutes before Prime Time began, we were having our chat. Mr Wilson was telling me about how he wanted out of Europe. I said my respect for what the EU stands for is personal because the E112 form that brought me to Sweden for cancer treatment 20 years ago saved my life. Sammy was telling me about the frenetic mix of meetings and interviews around Westminster the previous night and how he finally got a late night feed of chips and stuff. He is 66 now. I told him how I had a stent inserted last month so the puncture is fixed and the blow-out and car crash avoided, hopefully. Interactions like that with the likes of Sammy Wilson, Arlene Foster, Gregory Campbell, Gareth Robinson, Jerffrey Donaldson and Diane Dodds remind me, time after time, of how much we have in common with unionists. They enjoy conversation about what matters. Yet, as a party, the DUP has built its philosophy on principles of confrontation - No Surrender, Sell-Out, Not an Inch. Due to often bitter and sometimes violent experience, down the years, the suspicion was warranted. But nowadays, like much of US President Donald Trump’s antics, often the fear and rhetoric have little basis in reality. The proposition that the Irish approach to Brexit shifted when Taoiseach Leo Varadkar and Tánaiste and Minister for Foreign Affairs Simon Coveney replaced Enda Kenny and Charlie Flanagan doesn’t stand up to scrutiny. What changed was that the shadow of Brexit took over all agendas and that Leo Varadkar became Taoiseach the very month that the DUP became the power bloc required to keep Theresa May’s minority government in power. In public the DUP seem to thrive on being outsiders. Their founder, Ian Paisley, had a limitless capacity to invent bogeymen. Lundy was the Church of Scotland solider who went soft on defending the walls of Derry in 1689 and the DUP can rhyme off a long line of Lundys who have attempted to sell loyal Ulster down the river since. The Brexiteers recognise this instinct in the DUP and they make common cause in confronting the EU bogeyman. The thesis to set DUP pulses racing is the notion that Northern Ireland is about to be cut adrift from the United Kingdom, as part of a cunning plan to facilitate a united Ireland and confine Ulster unionists to a life of subservience. The tragedy, so far, is that unionists are not prepared to look beyond their own traditional suspicions. The Republic of Ireland they fear no longer exists. Drew Harris, the Garda Commissioner, the son of an RUC officer, murdered by the IRA, is this week wearing a poppy. The kind of Irish language provisions some campaigners were attempting to introduce in Northern Ireland do not exist south of the border yet the more creative approach it has taken to the language is allowing for more organic growth and popularity. If there was a poll taken in the Republic in the morning and the options were push for a united Ireland or commit to a 'live and let live' friendly relationship with our next door neighbours, the vast majority would probably opt for the latter. One of my happiest, most illuminating days in the company of the late Ian Paisley, was a time he spent in south Sligo. He was invited down to a peace park in a small village of Aclare; the organisers provided accommodation and lodgings for the extended Paisley family in the Yeats Country Hotel in the little village of Curry. Ian Paisley and his family were so contented during that visit because they felt welcome, among their own and they had a sense of the commonality between the people of Cullybackey, Co Antrim, and Tubbercurry, Co Sligo. The tragedy of the DUP’s current position is they are not prepared to explore the nature of the Brexit deal on offer to them. The fruits of the haggling between Theresa May’s main negotiator, Ollie Robbins and Michel Barnier’s European Commission team, is Northern Ireland has been offered unique status within the European Union and the United Kingdom. Although she is on maternity leave, Ruth Davidson, the leader of the Scottish Conservatives, was quick to spot this. So too was Nicola Sturgeon, leader of the Scottish Nationalist party. Like pupils in a classroom seeing some student offered a special arrangement, the SNP is envious. And the Scottish Conservatives know the Northern Ireland concession could be used by the SNP as a stick to beat them in future Scottish independence debates. Northern Ireland business organisations have spotted the advantages of the deal. They issued a joint statement, praising it on Friday. Significantly the Ulster Farmers Union, too, has come out in favour of what’s on offer. It wasn’t just the organisation’s chief executive, Wesley Aston, or its former president, Ian Marshall,who is now a Fine Gael appointed member of the senate. The UFU’s current president, Ivor Ferguson, a farmer in Markethill, Co Armagh, is also publicly supporting the deal. The chief constable of the PSNI, George Hamilton (above), has stood by his warnings about the significant problems that could flow from a no-deal Brexit. It is also true that Mrs May is seeking to reach beyond the Westminster bubble and use public opinion and different sectors as persuaders in her tussle with Conservative MPs and the DUP. Karen Bradley, the Secretary of State, left the Westminster chamber on Wednesday to meet business groups in Belfast. A number of meetings with business groups, using Chatham House rules (no leaking), were hosted by Ms Bradley’s team of persuaders last week. Might the DUP change tack? If a car is heading for a wall, or a ship for an iceberg, in order to avoid trouble something has to change. Had David Cameron been offered some recognition that he might have put his finger on something when he went looking to the EU for help, Angela Merkel might not be in the political departure lounge and the Remain Camp could have won the Brexit referendum. The DUP and Northern Ireland have indeed been offered a sweetheart deal. Not due to the European Union’s special affection for Northern Ireland but because it is the practical way to structure the withdrawal agreement, the border question included. Now the challenge for Theresa May and others is to persuade the DUP to see the merits of the offer or at least have its MPs abstain if not back the prime minister in the Westminster vote. Mr Varadkar has already acknowledged the realities in some of his comments at his party’s weekend Ard Fheis. He is attempting to signal that a goal of the negotiations of a future EU/UK trading partnership would see no need for a backstop or any sort of significant border. The Brexiteers will cling closely to the DUP as their new best friends, their pit bull in the Westminster battle. Northern Ireland was used as the off-shore vehicle to fund all of the final stages of the Leave Information campaign. The DUP’s ten MPs are crucial in the Westminster balance of power and Brexit voting equations. The package promised by the Brexiteers to Leave supporters is the UK’s right to make its own trade deals with outside countries and an EU that would only be delighted to give the UK unfettered access to its markets. If there is no border down the Irish Sea (a DUP demand), and no border on the island of Ireland (an Irish/EU stipulation), would the EU insist on checks at Calais, Rotterdam etc for Irish as well as EU goods? That’s the thinking of the Brexiteers who see a borderless Irish Sea and island of Ireland as the formula to shift the pressure onto the EU, Ireland included. The DUP as the Brexiteers' foot soldiers, the island of Ireland as the Trojan horse. For the past week news bulletins and newspapers were dominated by the Brexit story. But within Northern Ireland, two highly significant developments that play into the bigger picture took place. On Tuesday night BBC’s Spotlight transmitted a programme that got little or no traction. It was about the Renewable Heat Incentive Inquiry in which the DUP, its leader Arlene Foster and the party’s modus operandi are under severe scrutiny. Witnesses to the inquiry voluntarily submitted their email and telephone activity to the investigators and the relevant and often controversial information surfaced during the hearings. But Mr Justice Coughlin and his team may now seek a further information trawl, this time conducted by independent experts to supplement what came from the voluntary provision of information. This may lead to further revelations but it will also take time. It is not implausible that the Inquiry’s final report, expected in March/April could be further delayed - a far from encouraging omen for the resumption of power-sharing at Stormont. A second significant development relates to the long-planned motorway between Counties Monaghan and Derry. In the absence of a power-sharing, decision-making minister, a Stormont department had sanctioned the construction project but it was being challenged by landowners. Sensing it might be over-stepping its remit, the department has now pulled back from the project, the legal proceedings become unnecessary as the motorway work is put in cold storage. Northern Ireland adds to its reputation for procrastination and paralysis. These two developments feed into the pattern of the DUP as a party locked in the process of blocking, defending, confronting, saying No. Within unionism it has no opposition. The highly influential Jim Allister is a tougher version of the DUP but he is the sole Assembly member if the Traditional Unionist Voice. The Ulster Unionists continue to be an ineffective form of DUP lite. But if the DUP’s behaviour is spreading the notoriety of the brand, it is taking the party further and further away from power and power-sharing in its own backyard. One is torn between two Brexit questions: Can you fix Stupid? ; Is Have To the Ultimate Master?